Tea production this year is expected to nudge last year’s figures despite a marginal dip, during the first seven months, said Chairman, Colombo Brokers Association, Sugath Munasinghe. He said that production by the end of the year will reach around 320 m kilos despite the adverse weather conditions, during the first half of the year. Last year 323 m kilos of tea was produced. Production up to July this year was 195.07 m kilos, this is a drop of 1.04 m kilos compared to the corresponding period in 2010 which was 196.11 m kilos. Tea production in July this year was 24.1 m kilos which is a drop of 3.2 m kilos compared to the corresponding month last year which recorded 27.3 m kilos. “The drop in July was due to unfavourable weather. The industry anticipates good production during the rest of the year”, Munasinghe said. He said that despite the turbulence in the Middle East and North Africa, tea exports have performed well during the first half of this year. 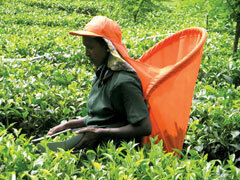 Around 55 percent of tea exports from Sri Lanka are sent to the Middle East, Gulf and North African regions. Director, Promotions Sri Lanka Tea Board, Hasitha De Alwis said that the consignments reach traditional markets, despite the turmoil in the region. Tea exports during the first half of this year was 149.7 m kilos as against 143.3 m kilos during the corresponding period last year, reflecting an increase of 6.4 m kilos. Tea exports to Iran, Iraq, Syria and Libya during the first six months this year was 38.3 m kilos compared to 35.8 m kilos recorded during the corresponding period in 2010, reflecting a 6.5 percent growth. Syria imported 13.1 m kilos of Ceylon Tea during the first six months this year compared to 11.8 m kilos during the corresponding period in 2010, which is a 11 percent increase. De Alwis said that there was a decline of 3.7 m kilos of tea imported by Libya, due to the escalating hostilities in the country but there has been a significant increase in cross border trade with access to the National Transition Council (NTC) controlled eastern regions through Egypt and shipments to Libya through Tunisia have continued.